Japan runs the world’s most efficient and convenient rail service. This tightly scheduled, safe, speedy and punctual train service is one the most popular ways of seeing Japan. High speed and safety are features of the Japan railway network where 300 km/h Shinkansens (bullet trains) connect Tokyo with Japan's major cities at intervals of approximately 15 minutes. Long distance trains provide convenient access to all parts of Japan. What is Japan Rail Pass (JR Pass)? 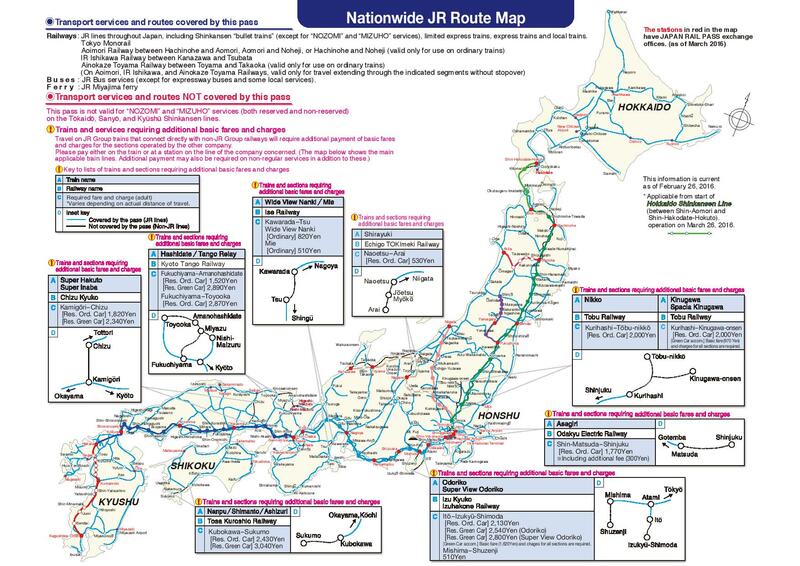 It is simply the easiest and most economical way of travelling all around Japan by train - the cost of just a single Bullet Train journey from Tokyo to Kyoto can cost as much as half the price of a whole week-long JR Pass! You can buy different types of Japan Rail Pass according to your length of travel (7 days, 14 days, 21days etc), grade of travel (Standard or 1st Class) and number/age of travellers. 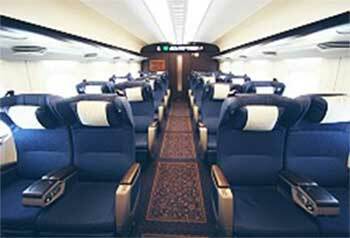 JRPassOnline is an authorized travel agent for Japan Rail Pass. We are part of Discover Japan Limited who are specialists in tailor-made individual itineraries for discerning travellers seeking authentic experiences in Japan. We are committed to providing you the best possible service! Who can buy a JRPass? Japan Rail Pass is only available to foreign tourists visiting Japan as a Temporary Visitor. (Japanese nationals living in Japan cannot apply) It cannot be bought in Japan and must be purchased outside Japan prior to your trip. Japan Rail Pass is essential for your memorable experience of Japan. What trains can I use with the JR Pass? You have unlimited travel on all Shinkansen Super Express trains (except Shinkansen “Nozomi”*), all limited-express and all express trains.It also allows unlimited travel on Japan Rail trains, buses and ferries. 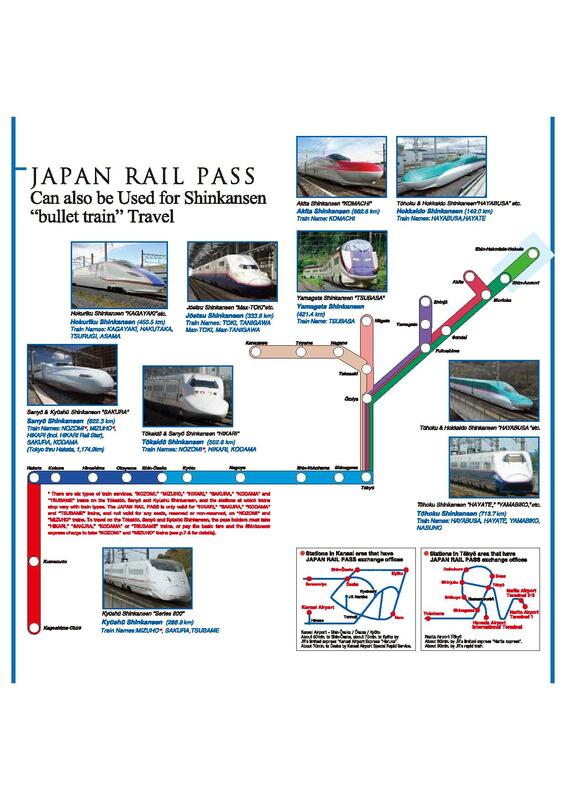 *At present, the Japan Rail Pass does not cover Nozomi class Shinkansen Bullet Trains on the Tokaido/Sanyo lines connecting Tokyo, Nagoya, Kyoto, Osaka, Hiroshima, Hakata ( Fukuoka) and other cities. There are however many Hikari and Kodama Shinkansen trains on the same lines so you can travel freely with a Japan Rail Pass. You should be aware though that long trips between Tokyo and Hiroshima or points further southwest ( Fukuoka, Nagasaki etc.) may take a little longer than with Nozomi trains. If you want to use a Nozomi train, you will have to pay full price for tickets. What are the differences between Ordinary and Green Car? 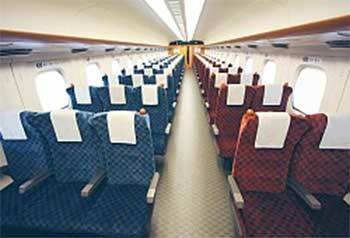 Ordinary seats are the regular seats found on all shinkansen trains. Although the size and foot space varies between trains, the seats are comfortable with a decent amount of foot space. They are usually set in rows of 3 x 2 seats. You will have to make seat reservations for each trip you take. This can usually be done just before you board, except during crowded periods like cherry blossom season and the August Obon travel season, as well as around New Year’s. How long is the JRPass valid for? The validity period of a JAPAN RAIL PASS is the consecutive 7, 14, or 21 days beginning on the date the PASS is first used. You must exchange your Exchange Order within 3 months from the date it was issued to obtain your JAPAN RAIL PASS. At that time, you have to specify the date that you want to start using the PASS. It can be any date within one month from the date the PASS is received. Once the PASS has a starting date entered on it, the date cannot be changed. What is an Exchange Order? An Exchange Order is what you receive from us. Can I make seat reservations? Seat reservations can be made without additional charges. Seat availability can not be guaranteed otherwise. To make a reservation, apply at any Travel Service Centre (View Plaza) or a reservation office (Midori-no- madoguchi) at a JR station. There, show your PASS, and obtain your reserved-seat ticket before boarding. Are there any luggage limitations? According to Japan Rail's official website, there is no restriction on taking luggage on board the Shinkansen (Bullet train). However, in practice, these trains are designed with quite a lot less luggage space than most other train services. If you only have one suitcase you shouldn't have too much of a problem. If it's not much bigger than aircraft "hand-luggage" size, it should fit on the storage rack above the seats. If you can get a seat at the end of the carriage, there is a little space behind the last row of seats where a suitcase will fit. If you have a reserved seat, it's quite possible that the carriage won't be too full, and you can fit your suitcase on a spare seat next to you or nearby. (Non-reserved ordinary-class carriages are usually too full for you to be able to do this). If you use the Japan Rail Pass, it is very easy to get a reserved seat: just go to the ticket counter and ask for seat reservation. If you travel in Green car (First class), there should be space between you and the seat in front for your suitcase to stand on the floor.